Recipe from Mark Trowbridge, Merchandise Manager, Neighborhood Market Division, Wal-Mart. 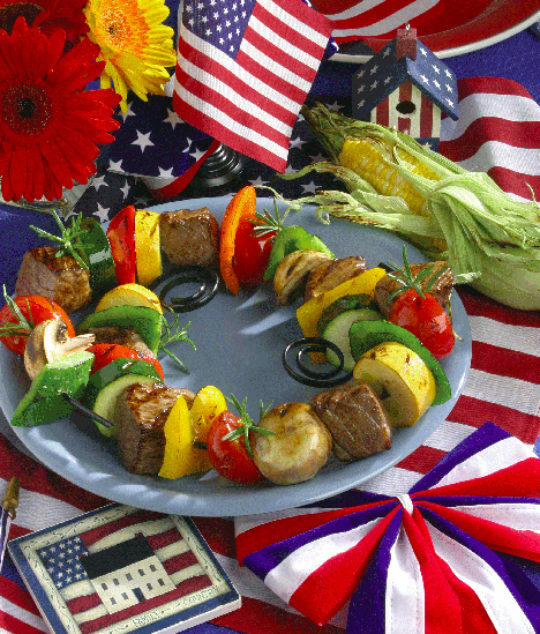 What's 4th of July without a backyard grill...and what better than a healthy kabob, full of vegetables fresh from the market or garden! Have fun by substituting mango, pineapple, and tomatoes or try pork, lamb or even chicken...any of your favorites. Cut marinated meat into 1-ounce chunks. Cut vegetables of your choice into large pieces – red onion, mushrooms, grape tomatoes, brightly colored peppers, yellow tomatoes, cherry tomatoes (put this on the end and add it last), summer squash, zucchini. Marinate veggies separately from meat. Soak wooden skewers in water to keep them from burning. Skewer, alternating meat with veggies. Spray with vegetable oil. Grill until meat is cooked thoroughly, rotating position on grill at least once. If using cherry or grape tomatoes, add just 1 minute before kabobs are finished cooking. Each recipe makes 3 servings. Fat, cholesterol and calorie content varies with different cuts of beef. Choose lean cuts such as round or beef loin, or trim fat from edges of meat.